Jackson DXMG; This was for a long time my “main” guitar, when I was playing mostly heavier stuff. Currently in E standard tuning, but about to be changed to D standard for some even heavier stuff. Samick Strat; My first guitar bought in about 1998 for 120 marks. That’s 20 euros. (Thanks Ville! :P) I love the feel of this guitar! It needs some fixing: The pickup selector only works in bridge position and the electronics seem a bit unreliable. I’m also experiencing the weirdest feedback noise when used with my Axe-FX Ultra and Reactor FRFR, which I’ll need to figure out. Ibanez GRX20; This guitar hasn’t been home in years. I was thinking I might remove the frets and make it a fretless guitar someday, but at the moment it’s collecting dust at my brother’s place. Ibanez AWS1000ECE-NT; My main acoustic guitar. I bought it second hand last summer from Levytukku and I’ve been liking it ever since. Ibanez Talman TCM50VBS; I bought this guitar from Espoon Musiikki thinking it was a lot better than it turned out to be. It felt better to play at the store than at home, which is weird. Very eletric guitar feel for an acoustic. Squier Classic Vibe Precision Bass ’60s; My only bass, at the moment, but I might buy another one in the future. Feels very bulky, just like a bass is supposed to feel. Fun to play some slap bass with this. 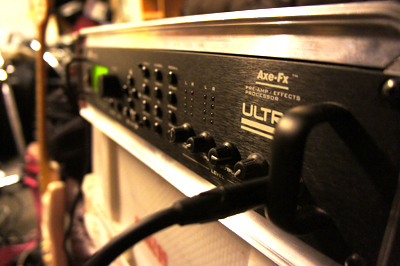 Axe-FX Ultra; The most expensive single thing I’ve ever bought. Ever. Also the best piece of gear I have. It’s constantly being updated with firmware patches and keeps sounding better and better, the more I get to know it. This can be a very complicated piece of gear, if you want it to be. The only thing I’m missing is a proper foot controller. I’ve been using Behringer FCB1010 as a controller, but it lacks features. Reactor FR Cabinet; Cabinet that goes along with Axe-FX Ultra. It has tubes, so it must be good! Full range, flat response, and enough low-end kick to take down the Berlin Wall. Trace Elliot Tramp; My first amp! Cost about 4000 marks, if I right recall. Basic amp, sounds okay, but won’t blow your mind. Crate GX-15R; An amp I got when purchasing Ibanez GRX20. Small and discrete, suitable for practicing at home.. Microphones & DI boxes; Sennheiser e602-II, Sennheiser e906, Shure SM57, Behringer C-2, Behringer ECM8000, RØDE NT-1A, Tech 21 SansAmp Bass Driver Deluxe. Audio interfaces & speakers; A pair of Genelec 8020A (kinda wish I would’ve waited for 8020B), E-MU0404, DigiDesign MBox2. Guitar effects, stands, cables and other less cool stuff..
+ the synth my parents bought me in 1994.